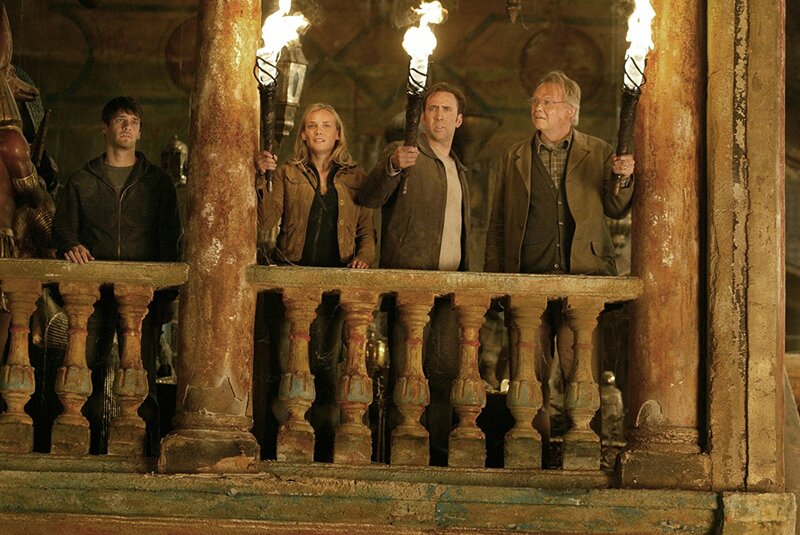 A modern-day treasure-hunt adventure, National Treasure offers slick escapism in a glossy production package. Mesmerized by stories he heard as a child from from his grandfather (Christopher Plummer), Benjamin Franklin Gates (Nicolas Cage) has dedicated his life to finding the fabled treasure of the Knights Templar, despite the cynicism of his father Patrick (Jon Voight). The treasure may now be in the United States shrouded in the mythology of the founding fathers and the secretive Masons. To track down a key clue Ben and his friend Riley (Justin Bartha) obtain funding from the shady Ian Howe (Sean Bean) and uncover the wreck of the ancient ship Charlotte under the North Pole ice. On board they find clues pointing to an invisible treasure map on the back of the original Declaration of Independence. Ben and Ian disagree on how to proceed, causing a major falling out. 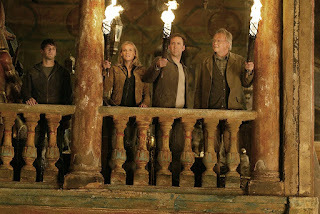 Ben connects with Dr. Abigail Chase (Diane Kruger) of the National Archives, but cannot convince anyone that the Declaration is at risk. Ben and Ian concoct separate plans to steal the highly protected document, setting off a massive chase and the attention of FBI Agent Peter Sadusky (Harvey Keitel). An unlikely collaboration between family-friendly Disney Studios and action-loving producer Jerry Bruckheimer, National Treasure is a respectable urban take-off on Indiana Jones-style adventurism. Directed and co-produced by Jon Turteltaub, the film carries the singular objective of providing treasure-hunt style thrills. Logic, physics and common sense mostly stay out of the way, yielding to fun, a well-executed dual heist sequence, energetic chases and descents into impressive cavernous spaces. Arriving at the perfect time about 18 month after the release of the sensational bestseller The Da Vinci Code, National Treasure borrows many of Dan Brown's better points. The pacing is fast enough to glide over the inherent absurdities, the clues often hide in plain sight and within historically famous artifacts, Ben is an extraordinary on-the-fly puzzle solver, a smart and capable woman joins the chase, and as the end draws near the dangers and close calls amplify. With a strained father-son relationship coming into play between Ben and Patrick, the film also colours in a decent background for its reluctant hero. Although he lands on the side of marginally colourless, Nicolas Cage maintains control and brings Ben to life as a man fully aware that his life may have been frittered away chasing a myth. Cage is surrounded by a good cast, Sean Bean in particular heartily sinking his teeth into another villainous role. Lighthearted yet genuine in its intentions, National Treasure never threatens to astound but does follow the right map.